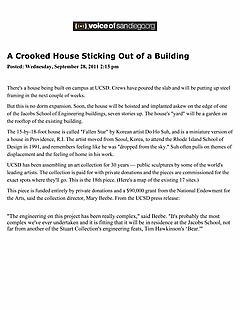 There's a house being built on campus at UCSD. Crews have poured the slab and will be putting up steel framing in the next couple of weeks. But this is no dorm expansion. Soon, the house will be hoisted and implanted askew on the edge of one of the Jacobs School of Engineering buildings, seven stories up. The house's "yard" will be a garden on the rooftop of the existing building. The 15-by-18-foot house is called "Fallen Star" by Korean artist Do Ho Suh, and is a miniature version of a house in Providence, R.I. The artist moved from Seoul, Korea, to attend the Rhode Island School of Design in 1991, and remembers feeling like he was "dropped from the sky." Suh often pulls on themes of displacement and the feeling of home in his work. "The engineering on this project has been really complex," said Beebe. "It's probably the most complex we've ever undertaken and it is fitting that it will be in residence at the Jacobs School, not far from another of the Stuart Collection's engineering feats, Tim Hawkinson's ‘Bear.'"